Sisa Abu Daooh is Egypt’s matriarch of the moment, after being named by officials in her home town of Luxor as the city’s most supportive mother. Which may come as a surprise: for she is Luxor’s “best mum” by virtue of having worked and dressed for more than 40 years as a man. 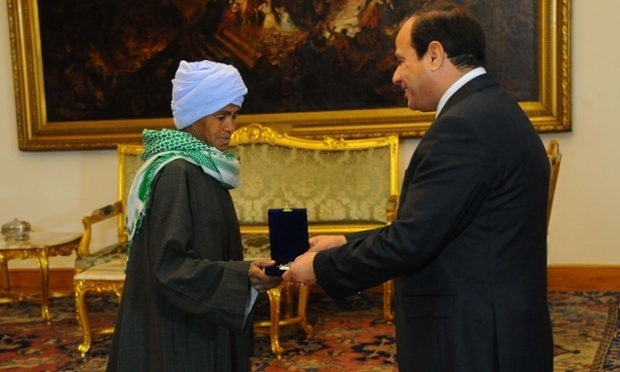 Abu Daooh, 65, met Egypt’s president, Abdel Fatah al-Sisi, on Sunday to receive an award. She said she was not going to stop living as a man. It was a life she began in the 1970s when her husband died. She was six months pregnant with their first child. These days, at least 1 in 7 Egyptian breadwinners is a woman, but 40 years ago, her conservative family did not consider it appropriate for her to work. The suitors weren’t for her. But according to her siblings, neither was a working life: labouring jobs were closed to women, and she lacked the education for an office job. So to the fury of her family, Abu Daooh chose another way of finding employment: she took on a male identity. She shaved her head, wore loose-fitting male robes and made bricks and harvested wheat. Initially as “strong as 10 men”, by her account, she later took to shoe-shining once her strength began to fade. Many people realised she was female, calling her Umm Hoda, or Hoda’s mum – a common form of address in the Middle East. “I never hid it,” she remembers. “I wasn’t trying to keep it a secret.” Gradually her renown grew, to the extent that she now claims “the whole city of Luxor knows I’m a woman, from the smallest kid to the biggest man”. Eventually, this fame paid dividends. This year, the local government in Luxor named her the city’s most devoted mum – documented on a certificate she cannot read – and gave her a kiosk to help support her income. Even now she has a family to support; her daughter’s husband cannot work through illness, so she helps put food on the table for the grandchildren. As gruelling as this makes her life, she would not want to see Hoda make the same sacrifice she did more than four decades ago. I admire Sisa Abu Daooh for her courage, determination, devotion, sense of responsibility, and finding meaning in sacrifice.